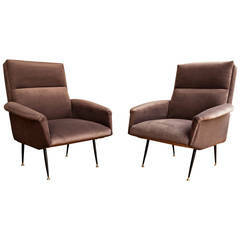 Elegant pair of armchairs, Italy circa 1950, reupholstered by Designers Guild light brown/silver fabric, black lacquered metal and brass feeds. Great pair of Scandinavian armchairs, fully restored. New upholstery and refinished teak wood legs and arm rests. Sophisticated taped legs. Subtly textured cream fabric cover. Pair of Italian armchairs circa 1950, new upholstery.